This is the Cargomaster with a revolving turntable for the prize field. 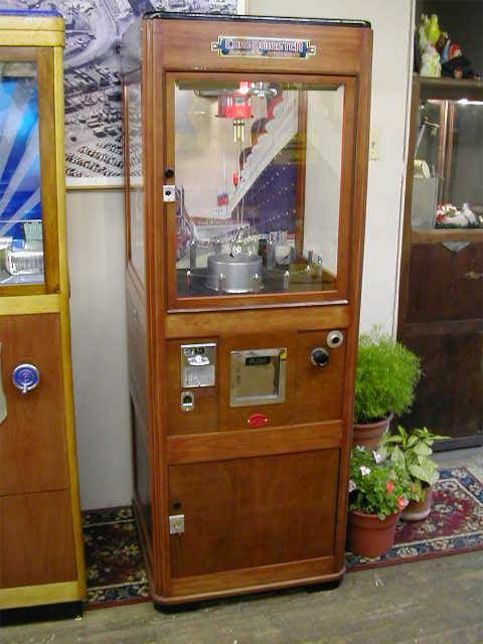 It also has an unusual ‘mouse ear’ coin mech and much of the mechanism is hidden in the top of the machine. When this digger was restored I built a glass top on the cabinet so that anyone interested in the unusual mechanics could watch the ingenious operation of the chains and chain arms. The drop of the claw from overhead is very much like the modern-day crane games, and this antique is now, fittingly, on display in the home of an executive of a modern day crane game company.